The contentious Citizenship (Amendment) Bill 2016, which has been listed in the revise list of business for Rajya Sabha to be tabled by the Union Home Minister Rajnath Singh today could not be tabled due to ruckus in the parliament over issues where Samajwadi Party leader Akhilesh Yadav was not allowed to attend a meeting at UP by the Chief Minister Adityanath Yogi. Without presenting the Bill which is burning the entire states of North East India , Rajya Sabha was adjourned till 11 am tomorrow after the ruckus. Rajya Sabha Chairman Venkaiah Naidu today urged members to let the House function smoothly. His appeal came following yesterday’s disruptions that led to adjournment of the House for the day when the Congress MPs walked up to the well to protest. Meanwhile, members of the Manipur Pradesh Congress Committee (MPCC) led by CLP leader Okram Ibobi and CWC member Gaikhangam, who is also the President of the MPCC along with other MLAs today staged a protest demonstration at Jantar Mantar New Delhi. Spokesperson of the MPCC Kh Joykishan while talking to this reporter said that even though the contentious CAB Bill has not been present today there is still possibility that it may be presented tomorrow. “The Congress Party has issued Whip to all the RS MPs of the Congress and the Congress will move every steps to block the Bill from getting passage in the Rajya Sabha”, Joykishan said. He further said that the Congress MLAs will continue the sit-in-protest at Jantar Mantar tomorrow as they might present the Bill tomorrow. He also said that there is also possibility that the RS session extends till Feb 15. Joykishan however did not confirm that matter about extension of the session. Meanwhile, BJD of Orissa had assured to oppose the Bill to Akhil Gogoi team which has been campaigning against the passing of the Bill tooth and nail. When the Congress party held protest at Delhi, people across the state also stage protest at many part of the state. Till the filing of this story police resorted action against protestors at Singjamei and Kwakeithel area. Sounds of firing tear gas shells and mock bombs fills the air of Imphal. District administrations has imposed indefinite curfew in Imphal West and Imphal East district in the wake of the series of mass agitation being underway in the two districts in protest against the contentious Citizenship Amendment Bill 2018. The district administration has also issued order to stop broadcasting of peoples’ agitation against Citizenship Amendment Bill in local cable TV channels. Data Service has also been down since last midnight even though no notification regarding the ban has been made available to media houses. But source said that the data internet service providers have been asked to shut down until the impasse continues. As per order issued by the district administrators of both Imphal East and Imphal West the prohibitory order is being issued under Section 144 of the CrPC as there is an apprehension of serious breach of peace , disturbances to the public tranquility and grave danger to human lives and properties in the area due to the situation arising out of the intense agitation launched by various Civil Society Organisations under the banner of Manipur People Against Citizenship Amendment Bill 2016 (MANPAC) and People Alliance Manipur (PAM) against the passing of the Citizenship Amendment Bill 2016. In another order issued by the District Magistrate Imphal West, broadcasting or transmission or retransmission of agitation /protest of any form, inflammatory speech or public discourse that may incite to violence,or any programme which may lead to breach of public peace and tranquility in the interest of the general public by local cable TV channel has been prohibited under Section 19 of the Cable Television Network (Regulation) Act, 1995. The order means that the two popular local cable TV network – ISTV and the IMPACT TV will have to stop broadcasting discussion on issues of CAB at the same time any protest of agitation against the CAB bill at the street of Imphal could not be transmitted. Section 19 in the Cable Television Networks (Regulation) Act, 1995 conferred Power to prohibit transmission of certain programmes in public interest to the District Administration. If in case the authority thinks it necessary or expedient so to do in the public interest, he may, by order, prohibit any cable operator from transmitting or re-transmitting any programme or channel if, it is not in conformity with the prescribed programme code referred to in Section 5 and advertisement code referred to in section 6 or if it is likely to promote, on grounds of religion, race, language, caste or community or any other ground whatsoever, disharmony or feelings of enmity, hatred or ill-will between different religious, racial, linguistic or regional groups or castes or communities or which is likely to disturb the public tranquility. Peoples Alliance Manipur (PAM) today said that people of the state today defy the curfew imposed by the district administration and stage various form of protest at many part of the states particularly in the area where curfew is being imposed. 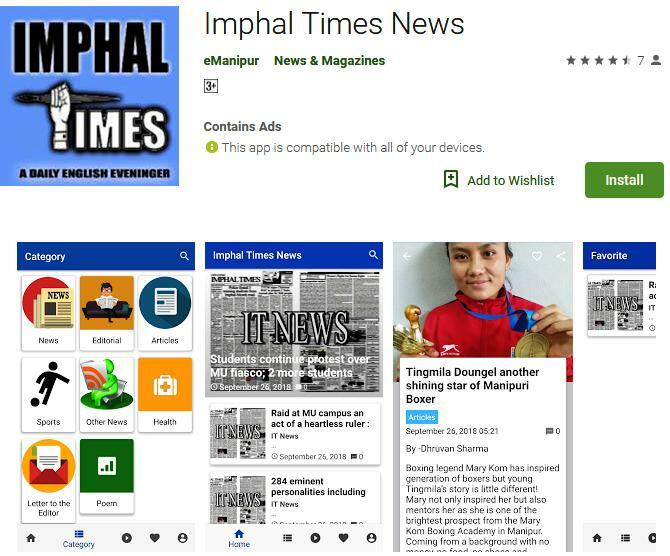 “People at various part of the state particularly in Imphal West and Imphal East where the curfew is being imposed came out and dare tear gas and mock bomb of the police which tried to stop them from staging protest”, a convenor of PAM talking to Imphal Times said. He said that protestors came out since early morning to stage protest. Terming today’s protest as the mass success of the people of the state, the PAM Convenor said that there has been no record in the history of the world where the peoples’ movement could be suppressed. The PAM convenor further appealed the people to continue the protest and said that PAM will also keep continuing the protest along with the people. The PAM convenor said that even as the Bill cannot be table today at the Rajya Sabha due to ruckus in the house, there is still possibility that the Bill be tabled tomorrow as the house will start from 11 am tomorrow. ”Cow politics has been a Sangh Pariwar tool, which they used to win Hindu sentiments. This cow politics gave rise to the horror of cow vigilantism. Over the past few years, dozens of innocent Muslims lost their lives by the hands of Gorakshaks constitued of Sangh Pariwar outfits. It created a situation in the country that, mere accusations, whether right of wrong, of holding beef or transporting beef, became sufficient reasons for getting brutally lynched in public. The state of Madhya Pradesh also witnessed many such incidents. Minorities in the state looked at the winning of Congress with relief thinking that they would end this lawlessness and bring the Goraksha criminals before law. It is quite disappointing that the opposite is happening. State government is acting to fulfill the agenda of Gorakshaks. By linking cow slaughter and cow transportation to national security, the Congress government led by Kamal Nath has shown his closeness to RSS perception of nationalism”, a stement of the PFI said. The statement further said that though some Congress leaders have expressed their disapproval of this grave misuse of law, the party failed in correcting their chief minister. The Central Secretariat meeting reminded the Congress national leadership that by not preventing such misdeeds by M P government, Muslims and other religious minorities are getting more distanced from the party on the eve of general elections. The ‘ban’ of Internet: Who is going to compensate the lost? Banning the internet (data service) is becoming an instrument of the present government to control any public uprising or agitation against the government. This is perhaps the second time that the N. Biren Singh administration has shut down internet service (data) in the state. Similar ban to the data internet service was done by the N. Biren Singh administration when the state witnessed mass protest against the then VC of Manipur University by the University community which was later joined by the people of the state. Everybody knows – the ban is to control the present uprising by the people against the passing of the contentious CAB. Can they do that by banning the data internet service? And if they can’t had they every calculated the lost due to the banning. And who will recover and compensate the lost of those whose business is depended on Internet service. Seems like the Biren Singh Administration seem to have forgotten that holding back access to the internet, deemed a basic human right by the United Nations is frustrating as these shutdowns threaten the democratic working of nations, and also point to the steady normalization of the mindset that permits such blanket restriction on Internet access. International human rights law protects the right of people to freely seek, receive, and provide information and ideas through all media, including the internet. Security-related restrictions must be law-based and a necessary and proportionate response to a specific security concern. India has witnessed numerous Internet shutdowns for various reasons, all under the same provision of law - Section 144 of the Code of Criminal Procedure, 1973 (CrPC). This section resides as the sole occupant under the chapter of ‘temporary instrument to maintain public tranquility’ and gives State Governments the power to issue orders for immediate remedy in urgent cases of nuisance or apprehended danger. However, the increasing use of this provision to completely shut down the Internet is becoming a cause of concern, for the reason that it amounts to a direct violation of the fundamental right to freedom of speech guaranteed under Article 19(1)(a) of the Constitution of India. The Current ban on Cellular Data in Manipur which was imposed since today morning by the Government amidst the present volatile situation without considering the pros and cons of it may be term as a thoughtless and ignorant. While the whole of country is talking about digital India, the internet bans make the auspicious project of the central government as meaningless. Majority of the Internet users in Manipur relies on Cellular data. Be it using social media sites, doing business transaction or purchasing goods, most of the people uses their Smartphone using Cellular data. All these have been disrupted with the current Internet ban. Adding to the woes is the disabling of SMS for all service providers. SMS also plays an important role with cashless transaction. For example, when doing an online purchase through Internet banking, Debit Card or Credit card, one needs a special code called One Time Password (OTP) that is delivered to the users registered number at the time of transaction and this has been disabled too with the current Internet/SMS ban. It may be mentioned that the ban on SMS is to prevent any dissemination of unwanted message through this medium. One wonders, who uses SMS in this era of WhatsApp and Facebook to exchange messages. If the Government thinks it is necessary to disable SMS to prevent from circulating unwanted messages, they could do so by disabling outgoing message and enabling incoming message. That way it would not disrupt anything. Department of Information and Public Relations (DIPR) released some facts on the Census of Manipur in local dailies on the 11th of February. These facts on the Census of Manipur came to light after ISTV’s discussion on Manipur’s demographic profile according to the 2011 census report. DIPR’s facts on Census seem to have some problems. First, the bar chart, with the title “Manipur Census 2011 as per mother tongue, religions and ST population,” takes into account the linguistic data on mother tongue, data on religion and data on schedule tribes in the 2011 Census. The bar chart categorises the population into Meitei/Meetei, Tribals/Schedule Tribes, Meitei-Pangal/Muslims and Others (for outsiders). Linguistic data of the 2011 census tells us that the total number of Meiteilon speakers in Manipur is 1522132. These Meiteilon speakers are both Meitei/Meetei and Meitei-Pangals. When we see the linguistic data, we do not know how many of the Meiteilon speakers are Meiteis and how many of them are Pangals as they have the same mother tongue. Dr Moirangthem Manimohon, in the said ISTV discussion, argues that we cannot find out the number of Meiteis from this linguistic data. But, we can infer the number of Meiteis from the religion data of Manipur in the census. Dr Moirangthem finds the population of the Meitei community through subtracting the Muslim population from the Meiteilon speaking population in the linguistic census data of 2011. He states that since the population of Muslims, according to the 2011 Census, is 239836, the total number of Pangal is also 239836 since as Pangals and Muslims are the same. DIPR estimates the population of Pangals based on the population of Muslims in the Census’ data on religion. It estimates the population of Pangals as 239836, the same as Dr Moirangthem’s numbers. This equation of Pangals with Muslims has serious problems. First, there are claims that politicians have made that there are Bangladeshi Muslims and Rohingya Muslims in Manipur. If all the Muslims in Manipur are indigenous Pangals who speak Meiteilon, then there are no Rohingyas and Bangladeshi Muslims in Manipur. Second, these numbers on Muslims in Manipur do not give any estimate on Pangals of Manipur. Outsiders population which is around seven per cent, according to Dr, Moirangthem and DIPR charts, includes Assamese, Bengalis, Hindi speakers, Punjabi speakers, Malayalam speakers and speakers of many other Indian languages. A large portion of these outsiders could be very well Muslims in religion. Afghans and Kashmiris who are living in Manipur, according to the Census, are Muslims. These outsider Muslims are not indigenous Pangals. Neither Dr Moirangthem nor DIPR bar charts make distinctions between the outsider Muslims and Pangals. The Muslim populations, which is 239836, consists of Afghans, Bengalis, Assamese, Kashmiris, Malayali, Hindi speaking and Punjabi Muslims along with Pangals. Therefore, the Pangal population cannot be estimated as 239836. It has to be estimated lower than this number. It means the Pangal population cannot be eight per cent of the total population. The eight per cent is for the combined population of Muslims and not for Pangals. There is a separate table for Muslims in DIPR’s facts on the census which all the local dailies published. There are no separate tables for non-indigenous communities or the hill people. The separate table on Muslims highlights that DIPR wants to convey the growth rate among Muslims in Manipur. The population of Muslims in Manipur saw a decline in 2011, according to the 2001 and 2011 Census. DIPR facts on the census fail to mention it. It gives no specific reason for these actions. However, it is not surprising that such data is being presented when the movement against CAB is going on furiously in Manipur. The focus must shift from non-indigenous to Muslims. It seems to be the plan. CAB did the same thing in Assam. From NRC for all, it became CAB for Hindus. The debate shifted from expelling all non-natives to expelling only Muslim non-natives. Such shifts did not work in Assam. It would not work in Manipur. The line is clear. It is not a matter of religion here. The case is about indigenity. This shift of focus from Mayangs to Muslim religion hides the fact that the non-indigenous population increased from one per cent in 1901 to eleven per cent in 1981 in Manipur. The non-indigenous population in 2011 is seven per cent. These drastic changes in the non-indigenous population are hidden in these DIPR charts and tables. We need to calculate the number of outsider Muslims to estimate the Pangal population with some accuracy. If we cannot estimate the Pangal population closely, we would not be able to determine the Meitei population from the linguistic data properly. Given the inaccuracy in estimating the Pangal population, the already inaccurate Meitei population seems more inaccurate. There are more things which should increase our doubts about these numbers. The census data is generally doubtful. These pieces of information can be easily manipulated given how state machinery functions in Manipur. It is also probable that people can fill in their mother tongue as Meiteilon when their mother tongue is something else for economic and political reasons. Second, sometimes it is good to doubt the numbers that the government provides. Many journalists and politicians have accused the BJP government of fuzzing GDP data and parameters multiple times to show that India is growing well. When we can doubt growth indicators, we can go one step further and question the census data too. We need to doubt it, especially when Muslims are isolated in the CAB row so that the Hindu mayangs do not get the heat of the anti-CAB struggle. The movement of indigenous people is not against Hindus or Muslims. It is against the settlers coming to the lands of the natives and the state that empowers these settlers. So, it does not matter whether settlers are Hindus or Muslims for the indigenous Meiteis and Pangals. In continuation of de-addiction drive undertaken by Moreh Battalion of 26 Sector Assam Rifles under the aegis of IGAR (South), the medical officer along with team carried out check up and provided medicine at Rehab Hope centre, Moreh Lhangtheng, Ward No 2, Moreh. A total of 52 patients with 42 men including 08 women and 02 children attended the medical camp during which they were educated on the benefits of drug free life and critical withdrawal symptoms associated with drug addiction. Inmates were provided counseling and provided medicines free of cost to alleviate their agony. The inmates thanked Assam Rifles for the unique initiative.